The Poppies01263 715779work01603 870304fax Self-cateringThe Poppies is a large family sized chalet bungalow, set in a peaceful country lane in the thriving village of Briston. This three bedroom holiday home has a ground floor bedroom and shower room as well as a further two spacious bedrooms on the first floor. The large kitchen breakfast room is a real hub of the home and has door out onto the garden. 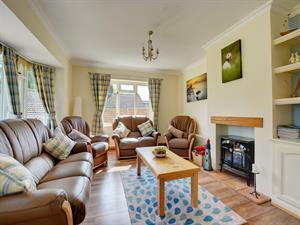 With a further two reception rooms there is space for all the family to relax. An ideal location to explore the North Norfolk Coast. • Other: Bed linen, towels, cot.